From Hamburg central station take the Metrobus 6 direction Borgweg (stop Kirchenallee) until stop Gertigstraße (approx.10 min.). Walk straight on in driving direction and turn left into Poelchaukamp, then right into Dorotheenstraße until you reach the hotel. Take S-Bahn line S1 to Hamburg central station. Change to Metrobus 6 direction Borgweg (stop Kirchenallee) until stop Gertigstraße (approx.10 min.). Walk straight on in driving direction and turn left into Poelchaukamp, then right into Dorotheenstraße until you reach the hotel. 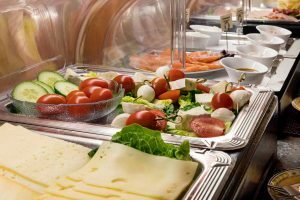 Enjoy our splendid breakfast buffet daily between 7.00 – 10.00 am, Saturdays an Sundays between 8.00 -10.30 am. Here we provide you with a complete list including the most important information regarding your stay and arrival.